But first, I suppose we need some suitable dynamic scripting music. The validation I have in mind is a simple one…check whether the number of characters in a description exceeds 80. On a side note, I was wondering why there is usually an 80 character limit on coding width standards? Apparently this hearkens back to the IBM punch card days. The length of the description exceeds 80 characters? The “print” function is useful because it allows you to do some troubleshooting within the scope of the validation. Now we at least know that our code is working. And if we need to check another condition? Very simple and very similar to any other scripting solution you’ve use in the past. Finally, we’ll add one last snippet of code. // Return error messages to the screen. Great, so now that all of that works, there is one last piece to the puzzle before we add this validation to a hierarchy. 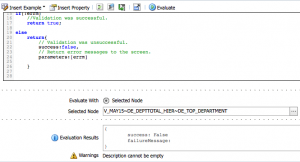 How do we set up a failure message so that we can get the parameterized messages to the console? That’s pretty simple too. All you need to do is put the following code in the Failure Message box. 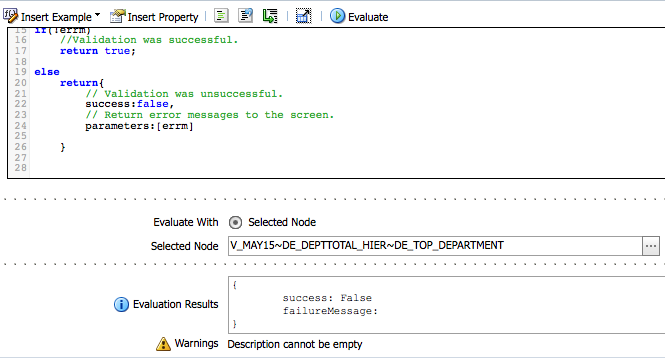 Now, we’ll attach the validation to a hierarchy and run the validation. Let’s check the messages that popped up. So as you can see, dynamic scripting is a powerful new addition to the DRM stack. There are so many uses one can think of for it. There will be other posts devoted to dynamic scripting in the future, so keep checking in from time to time. Thank you very much Vijay, the customised message for validation failure was causing me headaches. Nice post Vijay.. The good thing is you are sharing interesting things.. eagerly waiting for your future posts regarding java script.